Be under no illusions here. 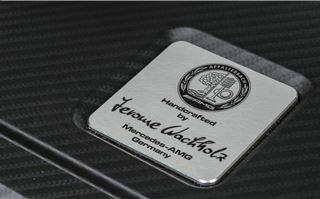 The Mercedes Benz A45 AMG is a very important car for its maker. 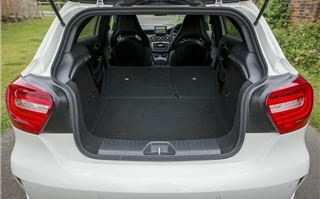 You see, AMG has made a name for itself building heavy-hitting V8 (and sometimes V12) saloons, estates, coupes and cabriolets - but never before has it built a hot hatch. 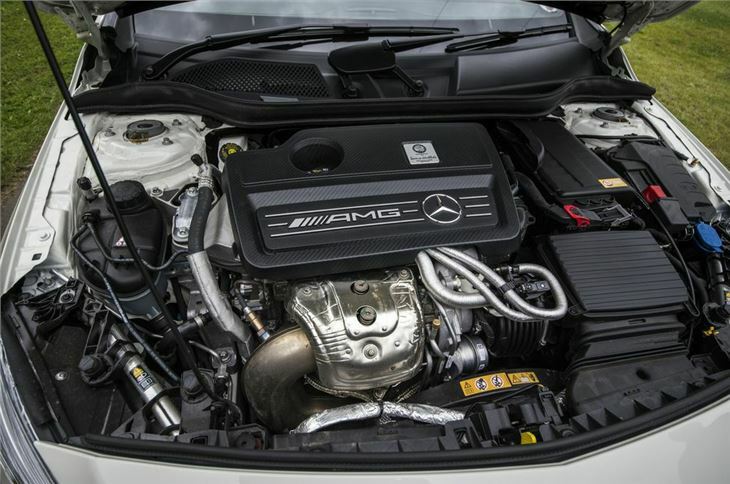 This, then, is a radical new direction for AMG and one with clear goals in mind. Firstly to create a halo for the rest of the A-Class range to bask under; and more importantly, to offer a three-pointed alternative to the mighty BMW M135i - the car which has re-defined what performance you can expect for £30,000-and-a-bit. 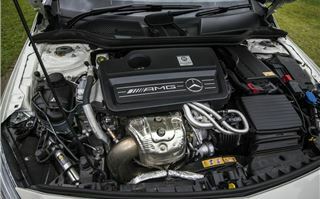 Good job, then, that Mercedes-Benz and AMG decided to crowbar in much more power than the 315PS the BMW can muster. 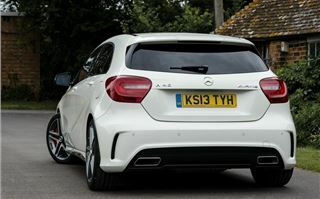 These are the numbers - the A45 develops 360PS from its hand-built turbocharged 2.0-litre four-cylinder, sprints from 0-62mph in a claimed 4.6 seconds, and comes with a starting price of £37,845. Visually you're getting rather a lot over the standard A-Class. But then you should - the standard car is a bit of a pudding from some angles and in certain colours. Firstly, you get a new bumper and grille at the front, in order to accommodate the intercooler and supplementary radiator. 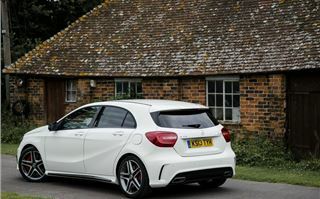 It's surprisingly un-aggreesive head-on, which adds to the A45's Q-ship appeal. Other visual modifications include lowered suspension (we'll get back to that), 18-inch diamond-cut alloys, side skirts, and twin exhausts. It's surprisingly subtle - for an AMG - and yet, to those in the know, it's instantly recognisable as a high-performance car. 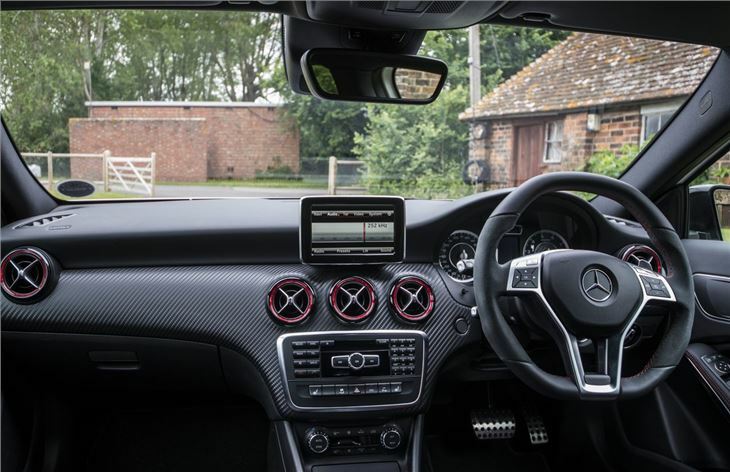 Inside, it's what you'd be hoping for - all the best bits of the A-Class (great fit and finish, spot-on ergonomics, big boot and good driving position), but with fitting AMG-specific additions. 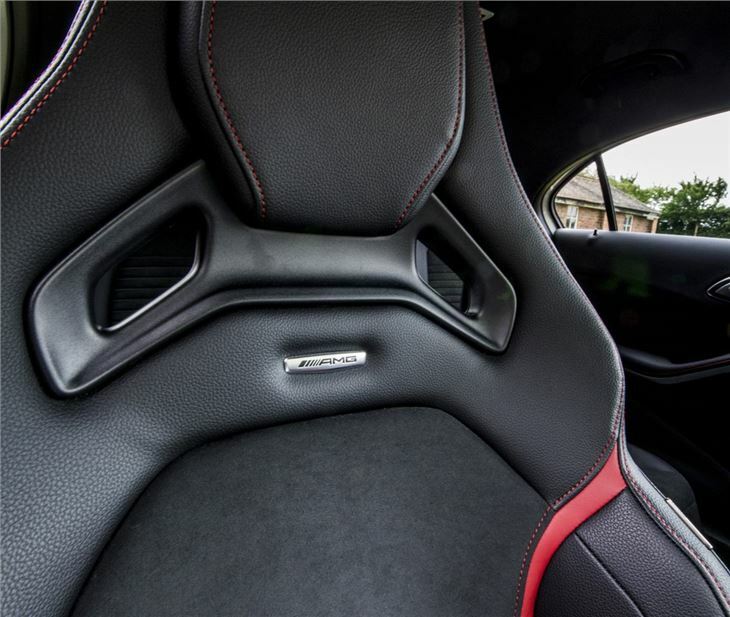 The firm sports front seats are wonderfully supportive and look great, while the black trim with red highlights - including seatbelts - works for us. 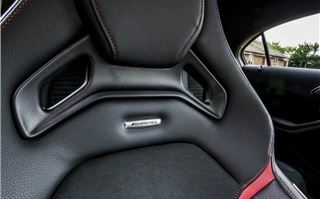 The dashboard's carbon fibre finish might be an acquired taste, though. The Command system's as good as it ever was and the add-on screen is funky, even if looks a little aftermarket at first glance. 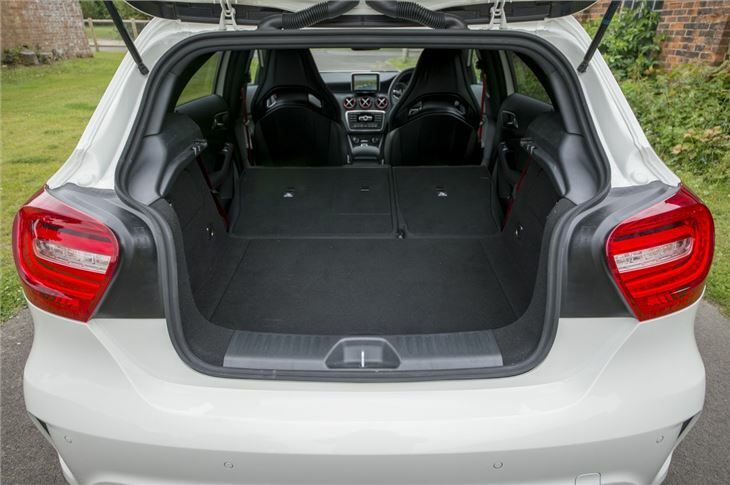 Changes to the steering and suspension are more wide-ranging than the ride-height. The steering knuckles have been changed for sharper turn-in and have been tuned to match the new rack fitted to the A45. The anti-roll bars, springs and dampers have also all been uprated, plus there's a new multi-link rear suspension set-up. The big news, of course, is the A45's use of the 4Matic transmission system, with seven-speed dual-clutch gearbox with steering wheel-mounted paddle shifters. It's not a permanent four-wheel drive system, but rather a part-time traction aid, splitting torque to the rear wheels when it's needed. 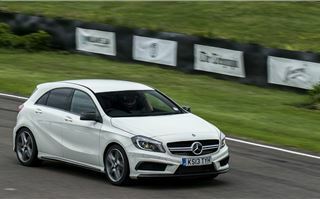 So effectively, for the majority of the time, the A45 is a front-wheel drive car. When you twist the key and start it up you're greeted with an interesting combination of sounds. The four-cylinder engine sounds distinctly flat and unremarkable at idle, but it's overlaid by a bass-rich exhaust note. Select drive and head off, and the throttle response is keen without being over-sharp, meaning you can moderate your speed easily. And that's a good thing, because when you poke the right-hand pedal hard, the A45 takes off instantly, and piles on speed with comedic ease. If you're using the A45 on typical British A- and B-roads, you'll be wanting to use the adjustable suspension's Comfort setting. Thus selected, the ride quality is suprisingly pliant, but the damping remains controlled on lumpier roads when you head for the corners at speed. In Sport mode it's far more responsive, turning almost aggresively into corners and tracking round them without a hint of body roll. The trade-off is a deterioration in ride quality, which can - on particularly pockmarked roads - literally knock the wind out of you. 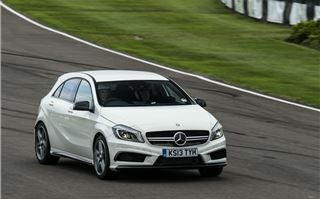 We were lucky enough to also get in a few laps of the Goodwood motor circuit and, on the track, in Sport mode, the A45 is very good indeed. The first thing that strikes you is how quickly it accelerates and how responsive the engine is. 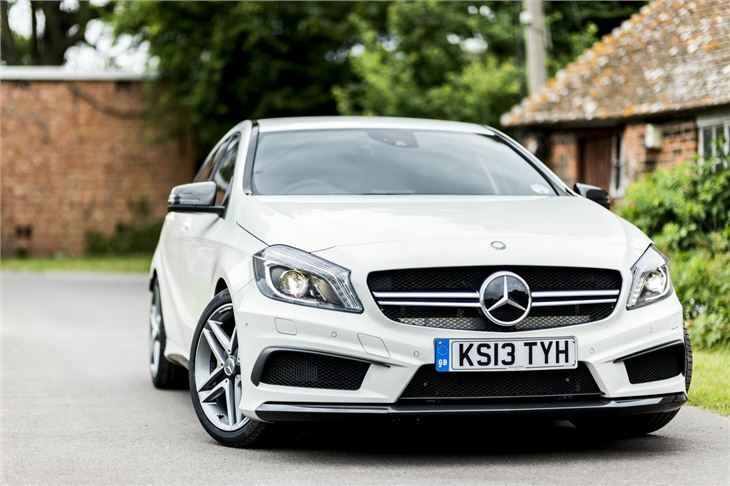 There's no epic soundtrack like you get with all other AMGs, but the four-cylinder unit revs cleanly, isn't too loud, and even under full throttle is remarkably civilised. And from 2000rpm through to 6000 it pulls relentlessly, quickly building to the red-line. The gearchanges are fast and punchy and even mid-corner changes fail to unsettle the car. Brakes are strong, with superb feel and are beyond reproach on the track, which bodes well for the road use. That fruity exhaust works a treat on track, too, popping when you back off the gas, and fizzing playfully at maximum revs. The second on-track revelation is that it's better dynamically than you probably hoped for. 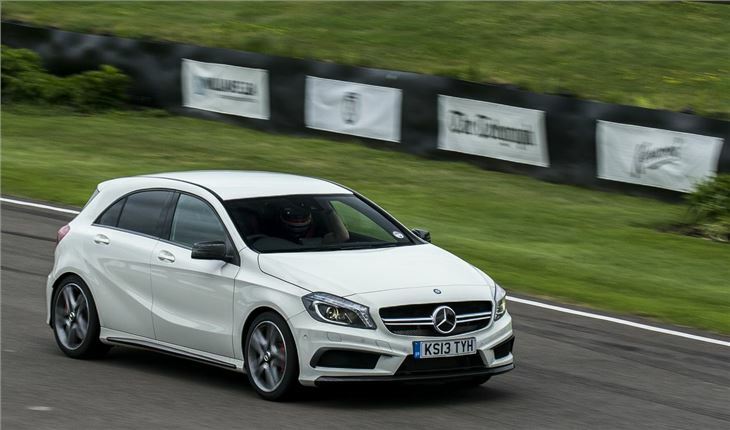 The incisive steering, flat cornering, and huge reserves of grip make the A45 a real hoot. 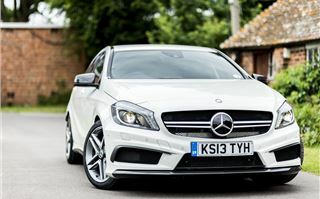 And it would take a very sensitive driver to pick up on what the clever 4Matic system is doing; just enjoy it for what it is - a responsive super hot hatch. Back in the real world, there's a final and very convincing string to the A45's bow. Its efficiency. It puts out 161g/km of CO2, and returns a combined average of 40.9mpg. Whether your average A45 owner will be quite that restrained with their right foot is another matter entirely. 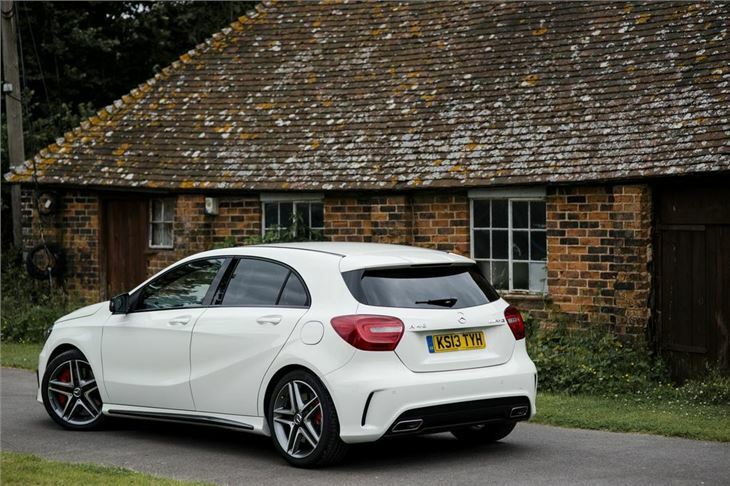 In summary, the A45 is a great addition to the hot hatch world. It sits comfortably at right at the top of the tree thanks to its towering performance, excellent handling and nicely crafted, roomy interior. It might not be as politically incorrect as its bigger brothers, but the A45 is certainly worthy of the badge. We'll temper all this with one proviso - at a starting price of £37,845, you need to be pretty committed to the cause to want to take the plunge. For those who are, it's money well spent.